I thought you might like to see (and make!) my birthday cake. It's been my birthday cake for a few years running now. It's so amazing. A little bit of work, but nothing that can't be knocked out in about an hour, minus the baking time. I got the recipe from one of my favorite books, 'Tamasin's Kitchen Bible' by Tamasin Day-Lewis (Daniel's sister!). It's great fun to read, and has loads of recipes you'd actually want to make. This is my new requirement for cookbooks. Would I ACTUALLY make them, ever in my life? If not, no matter how beautiful, how cool, how interesting - I'm not going to succumb to the sirens' song of those kind of cookbooks anymore. Tamasin's book is all about British food, but it's very much a collection of family friendly type of recipes, and I really love it. It's been a big favorite of mine since I demanded, politely requested it for Christmas three years ago. 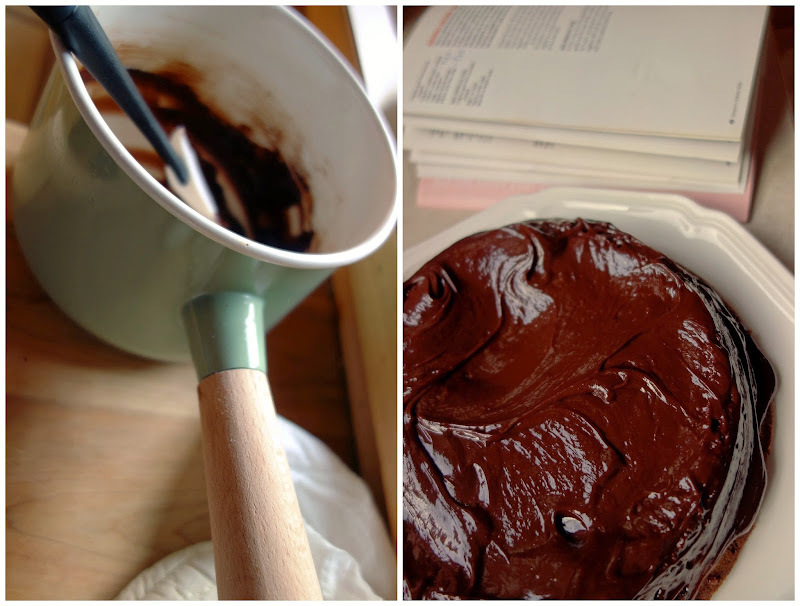 And Tamasin's chocolate cake recipe has become my go-to birthday cake recipe that I make for myself. My cakes for myself are usually always chocolate. Julia's cakes are usually lemon flavored. (I let our local bakery make hers) and Andrew usually gets some kind of anti-cake ~ brownies, cookies, carrot cake or cheesecake. DON'T MAKE THAT MISTAKE. I made it, and gave a huge hunk to my delightful and charming neighbors, whom I adore. I love them. And yet, I regret intensely letting so much delicious cake walk away out of my life. If I could take back that moment in time, I would. Because the next day, I had a BIG BIG sad, when I realized how little cake was left. To make matters worse, my sweet sweet husband got on the phone with his mama, who was coming over to meet our new puppy and bring me a birthday present. During this phone conversation, which I now call The Great Cake Debacle, Andrew's mama offered to make and bring over a marmalade cake. My sweet sweet husband who hates most cakes TURNED HER DOWN. He was like, 'nah, Melissa already made a cake and that would be too much cake.' (He hadn't realized that I had undergone a moment of insanity and given away a lot of the chocolate cake.) I was like, ANDREW. WE DO NOT TURN DOWN OFFERS OF CAKE. EVER. Anyway. Anyhoo. I've shaken it all off, a la Taylor Swift, and let's just let this serve as a cautionary tale. 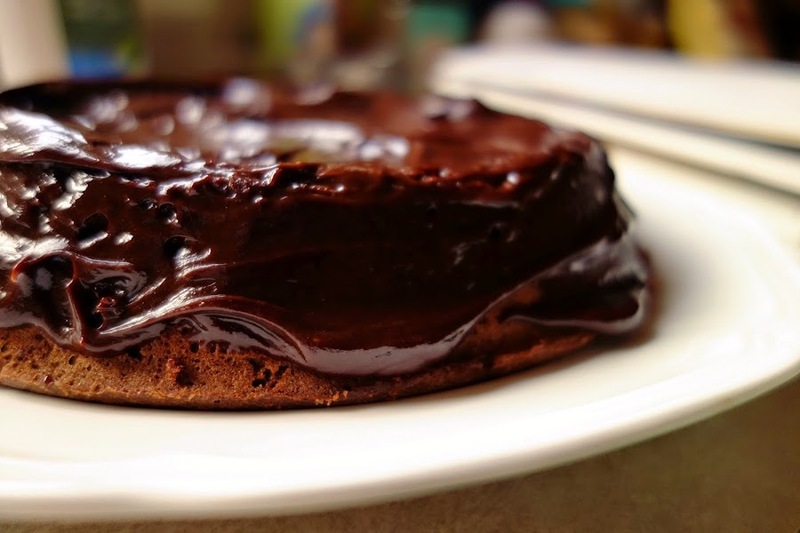 1) Make this chocolate cake. 2) Don't give any away. 3) Promptly accept all offers of cake, even if you think you don't want any. You will want it later and then you'll be SAD if you don't have any. Preheat oven to 350 degrees. Grease either two 7 inch cake pans or one 8 inch cake pan (which is what I use - I do one layer. I can't find 7 inch tins!). Melt the chocolate either in a saucepan or in the microwave. (which is what I do, checking every 30 seconds until almost melted and then I let the residual heat melt the rest.) Cream the butter with the sugar, either with a hand mixer or food processor, then add the egg yolks one by one, then the almonds, flour and the melted chocolate. Beat the remaining egg whites in a separate bowl until they form soft peaks, then gently fold them into the mixture, little by little. Divide the mixture between the cake pans and cook in the oven about 20 minutes. If using one deeper tin, cook for slightly longer (mine took about 40-45 minutes actually - I'd check at the 40 min mark - poke in the middle until a skewer is mostly clean.) Tamasin says that her daughter makes this cake and likes to "slightly undercook hers for a damp, sticky center." Put all the ingredients into a saucepan and melt gently over low heat. When smooth, leave to cool and then put into the fridge - it thickens as it cools, and becomes easier to spread. If you have two cake layers, sandwich them together with half the icing and spread the other half on top. If using one cake layer, cover the top and sides with all of the icing. SO SO GOOD. Don't give any away! Happy Birthday!!!! That cake looks delicious! Rule Number 3 is a given. Oh, Andrew. Melissa, this cake looks DIVINE. I can't wait to try it! You know I will. Well, that looks tasty! YUM. 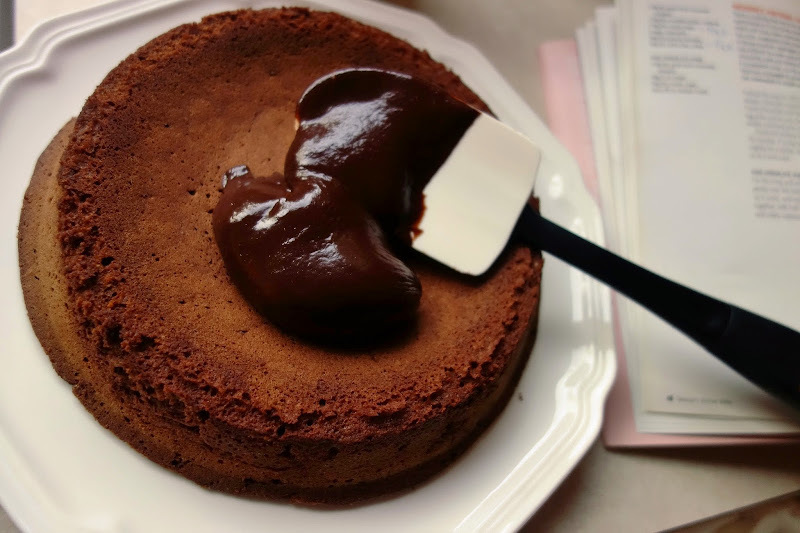 It looks like a flourless choc cake, but it does have a little - the addition of all the egg white mixed in gives the finished result a sort of mousse-like lightness, even though it's so rich. And the almond element is very subtle. It's amazing! Oh goodness, that looks amazing. I love baking cakes, I'll file this one away for the next birthday that comes around! you must try - you'll love it! Yum yum yum... it looks amazing! Do you think I could use all purpose flour instead of almond?? My daughter has a nut allergy. You've totally got me drooling. no drooling on the cake!! ha ha ha ha. 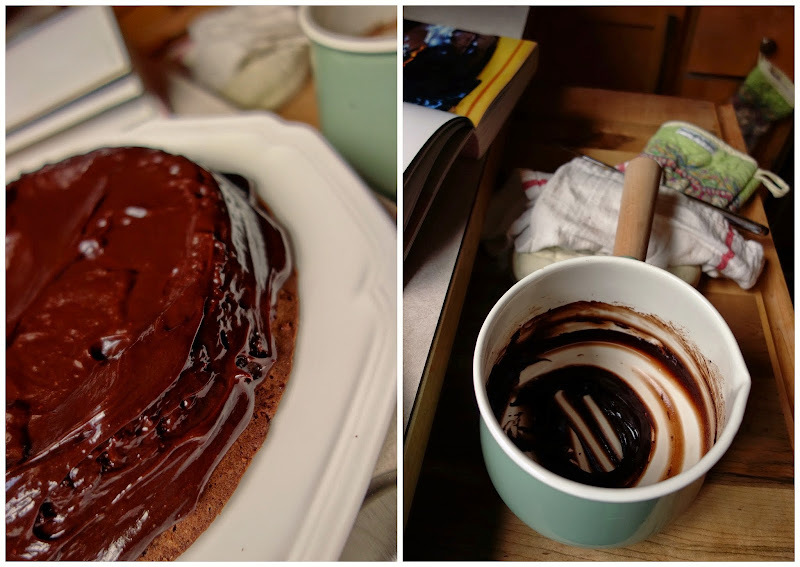 do you see the sheen of the chocolate glaze?? the sheen?? it's AMAZING!